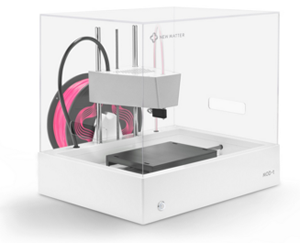 New Matter will give away 300 3D printers to schools over the next three months in conjunction with the widespread release of its plug-and-play 3D printing systems. The company, founded in 2014, has expanded distribution of its MOD-t 3D printer and made it available for $399 in hopes it will become more accessible to consumers, not just in schools but in businesses and homes as well. In conjunction with that widespread release, New Matter will give $200,000 worth of 3D printers and supplies to 200 schools around the country. As part of its new Educate and Inspire Grant campaign, teachers and administrators can apply for the free equipment before a February 5 deadline. "New Matter's ecosystem was designed to be simple and efficient," said Steve Schell, New Matter CEO and co-founder. "We are working with educators to ensure that the MOD-t is the easiest and most intuitive 3D printer for the classroom." Each of the 100 selected schools will get three MOD-t 3D printers, 15 spools of filament and 15 build plate surfaces. As part of the effort to make 3D printing more accessible, Schell pointed out that the MOD-t operates more quietly than most 3D printers available, making it easier to use in a classroom or library without causing disruption. Likewise, because it automatically calibrates, teachers can focus on instruction, rather than operating the technology. "Many teachers who use 3D printers in their classrooms say they often run into a bottleneck from having too many student projects to print, but not enough printers to print them all," Schell said. "Because of the affordability of the MOD-t, it is now possible for schools to have multiple printers in their classroom to print more student work faster."